Tupac Shakur Biopic 'All Eyez On Me' Hit With Copyright Infringement Lawsuit : The Record Kevin Powell conducted Tupac's career-defining interviews; now he's suing the filmmakers behind the biopic for using them without his permission. 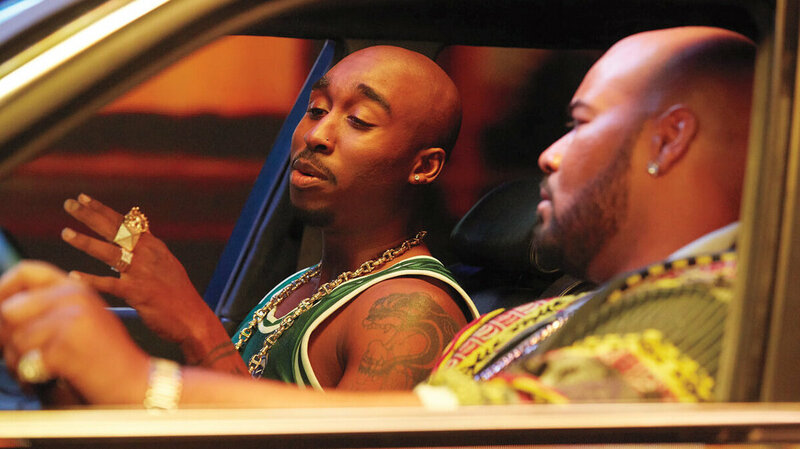 The Tupac biopic, All Eyez On Me, grossed $31 million in its opening weekend. A week after opening to a tepid critical response and accusations of historical inaccuracies from actress Jada Pinkett Smith — as well as a misinterpreted Internet joke that had many searching in vain for the appearance of an iPhone in the film — the Tupac Shakur biopic All Eyez On Me has now been hit with a copyright infringement lawsuit. "After viewing the movie twice in the past few days, it is clear that my exclusive Vibe cover stories on Tupac Shakur (when he was alive), were lifted, without proper credit or compensation of any kind to me." The list of defendants includes executive producers James G. Robinson, L.T. Hutton, screenwriters Steven Bagatourian, Jeremy Haft and Eddie Gonzales, as well as Morgan Creek Productions, Lions Gate and Program Pictures. Director Benny Boom was not named in the suit. Powell is seeking a series of damages, including $180,000 for each "broadcast" of the film. Lions Gate and Morgan Creek were not immediately available for comment on the allegations. The three Vibe articles in question — "Exclusive: Is Tupac Crazy or Just Misunderstood", "Tupac Shakur Jailhouse Exclusive", "Live from Deathrow" — were published in February 1994, April 1995 and February 1996, and offer a striking view into Shakur's famously nuanced thinking during the most critical time of his career. Notably, the suit's allegations rest, in part, on creations and embellishments that Powell placed in his Vibe articles. "While some of the content in these articles was factual," the complaint reads, "some portions of the article were changed or embellished by Plaintiff ... In fact, the name and character of 'Nigel' in [the Vibe articles] was specifically created by the Plaintiff without the authority or encouragement of Tupac Shakur. This made up character of Nigel was the embellishment of a real life character that was central to the narrative in [Powell's] articles." It also claims as infringing the use in the film of "metaphorical slang and strong language, including but limited to the liberal use of the f-word, indicative of the way rappers in the 1990's talk." As The Hollywood Reporter points out, these admissions could be interpreted as a legal tactic that allows Powell to claim ownership over biographical facts. Powell's attorney, Keith White, may have been pre-empting criticism of Powell on these points in a statement today, writing that "Kevin took creative license to protect the complex human being that was Tupac Shakur. This included fact-specific narrative changes and character creation in an effort to protect the legacy that Tupac was still building. Kevin's exclusive and intimate access to Tupac Shakur came as a result of the trust established over the years. The narrative that Kevin developed from many intense and exclusive moments with Tupac should not have been used in any film without Kevin's approval and consultation." Powell's lawsuit caps a week of controversy for Benny Boom's film, which grossed $31 million domestically in its opening weekend.